Standing Tall is the fourth film in the A Kalahari Family Series. After twelve decades of colonial rule, South West Africa is about to become the independent nation of Namibia and people are looking forward to democratic rule. Members of the newly formed, Ju/'hoan Farmers' Co-op travel throughout white ranching districts and black ethnic homelands to find long-lost relatives. Following Namibia's first national elections, United Nation troops help relocate these families to traditional Ju/'hoan territory. A Kalahari Family is a five-part, six-hour series documenting 50 years in the lives of the Ju/'hoansi of southern Africa, from 1951 to 2000. These once independent hunter-gatherers experience dispossession, confinement to a homeland, and the chaos of war. Then as hope for Namibian independence and the end of apartheid grows, Ju/'hoansi fight to establish farming communities and reclaim their traditional lands. 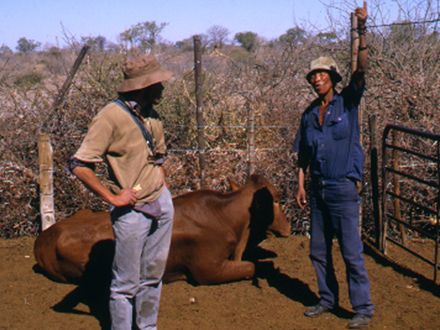 Through depiction of their efforts of the Ju/hoansi to participate as farmers in the contemporary economy and advocate for their rights to do so, the series challenges stereotypes of primitive and unchanging "bushmen". Visit the A Kalahari Family Microsite for more detailed information.